It is exactly 130 years since Gen Charles Gordon was hacked to death on the white steps of the governor-general's palace in Khartoum. It was a defining moment in Britain's colonial history. Stubborn heroism, laced with irony, and the over-reaching folly of imperial ambition. Today, it is China's turn to make its mark. Gen Gordon's whitewashed palace still stands on the banks of the muddy Blue Nile. 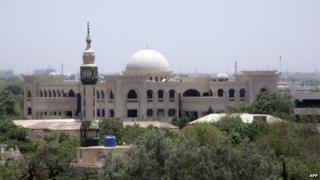 For years it has been home to Sudan's President Omar al-Bashir. But the Chinese have just built the president a vast new palace right next door and 26 January is its grand official opening - the date is unlikely to be a coincidence. The Chinese have form in such matters. In recent years they have built similar structures in Angola, Burundi, Guinea-Bissau, Lesotho, Malawi, Mozambique, Sierra Leone and Togo. The list could go on. You could call it soft diplomacy, or perhaps concrete diplomacy. China needs Africa's mineral wealth. In return, it has been accused of overlooking human rights. Sudan, for instance, has large oil reserves. Its president is currently wanted by the International Criminal Court (ICC) for genocide - he denies the charges. But China's role in Africa is evolving. It is building shopping malls and railway lines, and sending peacekeepers to South Sudan. Perhaps a million Chinese citizens now live and work on the continent. It is a very different world to the starched uniforms, paddle-steamers, and stiff upper lip of Gen Gordon's era.